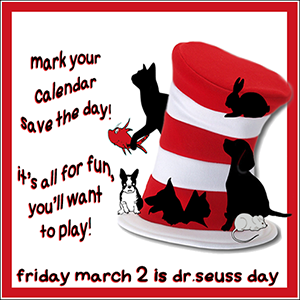 This is a cool fun holiday day which comes twice a year on February 28 & August 22. This year we were part of it! Read about the holiday here. 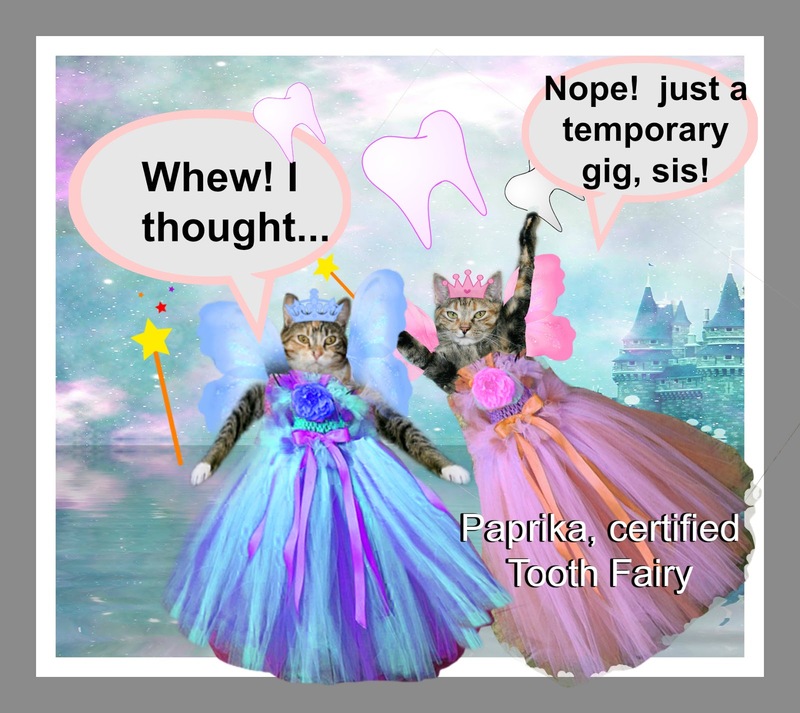 "temporary gig" called "Promotional Tooth Fairy." Twice a year one flies throughout the world to visit children who have lost their baby teeth. Once we gather all the teeth we take them to a special secret place. Then we go back to our regular lives. Sometimes we leave them an extra present... like catnip! 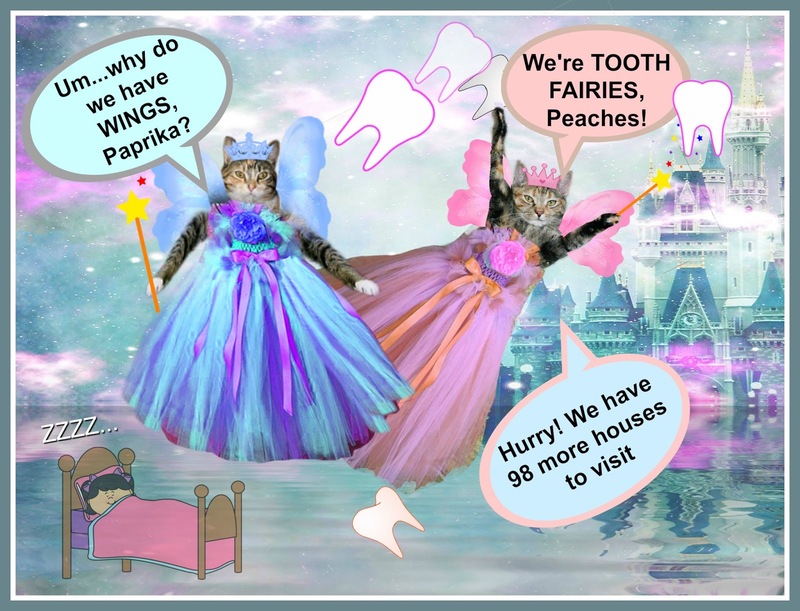 Regular tooth fairies do this daily, we are just hired to promote the holiday! 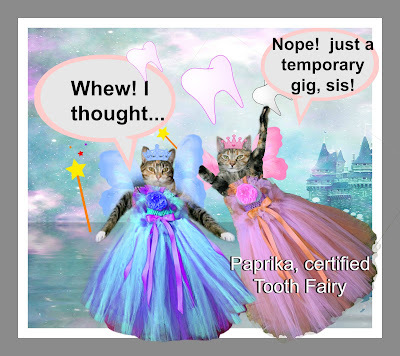 I did feel quite glamorous though in my blue organdy and Paprika, who became a "certified tooth fairy" last year showed me the ropes. Can hardly wait till August when we can do it again! Oh! So when I lost my teeth it was you girls who left me treats under my pillow! You're so cute! You two make the most perfect and beautiful tooth fairies! Whew! When I saw the title I thought one of you gots your teeth stolen. You are the two cutest tooth fairies we have ever seen! 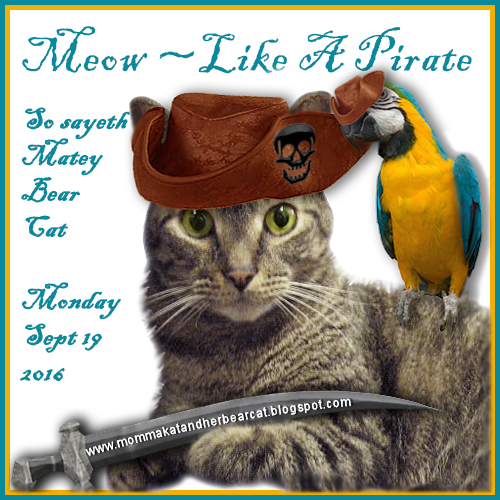 Mom poster the Secret paws Sunday night and it disappeared! She worked on it a little every night and finally got it up! We hope you enjoy it! You both make good Tooth Fairies. So pretty too. 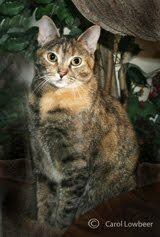 When I started reading I thought you both went over the Rainbow Bridge. Glad you didn't. Have fun with your new seasonal gig. How do I follow you on G+/Blogger? Please let me know. I'm not sure re G+ but you can subscribe to our blog right on top. Thank you for your interest! Tooth fairies are something every child wishes to meet. What a fun job! Flying around grabbing toothies from under each young kitty's blanket is without a doubt a fun job. You can have fklying races and see who is the quietest at getting teethies from under said blamkie. 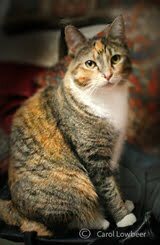 Then take all the teethies to Ellen of 15 and Meowing for a whole bunch of treats and toys. This is a win win situation.